The feast of Our Lady of the Rosary was established by Pope St. Pius V on October 7th to commemorate the anniversary of the naval victory won by the Christian fleet in Lepanto in 1571 near the coast of Greece. According to historians this was the battle which saved Christian Europe from being overrun by the Moslem Turks of the Ottoman empire at the peak of its power. Lost in the fog of time to many Christians today was the presence of the image of Our Lady of Guadalupe on the fighting ship of Admiral Gianandrea Doria. 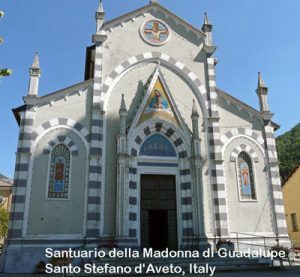 The original image was returned to the Sanctuary of Our Lady of Guadalupe church in the town of Santo Stefano d’Aveto in Genoa which was the fief of the Doria family. Today Catholics are called to devote their time to pray to our Lady of the Rosary and remember that we are living in perilous times with the resurgence of Moslem fanaticism around the world and uncertainties and fears concerning the state of our republic as we approach a very unsettling and troubling national election in November. Fr. George W. Rutler, well-known, erudite historian and author wrote a very insightful reflection on the “The Banners of Lepanto” published on the feast of Our Lady of the Rosary. His article is reproduced in its entirety below. Our Lady of the Rosary, Virgen de Guadalupe, pray for us! A British explorer ship that sank in the Arctic in the 1840s while searching for the Northwest Passage, was located this year on September 3, remarkably intact under the ice. The HMS Terror was one of the ships that attacked Fort McHenry in Baltimore in 1814. Some of the “bombs bursting in air” may have been fired from her. The Star Spangled Banner has attained a secular sacredness and is displayed with due civil reverence in the capital’s National Museum of American History. There were actually two flags, one for inclement weather, but the official one was 30 x 42 feet, big enough to be seen from a distance by the expected British fleet. The work of its sewer, Mary Pickersgill, whose mother Rebecca stitched the Grand Union flag, is far better documented than the traditions of Betsy Ross. The 37-year-old widow was helped by her 13-year-old daughter, Caroline, and an African-American indentured servant named Grace Wisher, and two nieces. The work took about seven weeks, starting at home and then, as things progresses, the materials were spread on the floor of an old brewery. The total cost was about $6,000 in today’s money. Restoration begun in 1998, repairing a rather botched job in 1914, cost $7 million plus another ten million or so for display and endowment costs. Not to diminish the Battle of Baltimore, the Battle of Lepanto ranks as one of the greatest sea battles of all time, and in one sense it was the most important. There never would have been a Trafalgar or Jutland or Leyte Gulf without it and, as a matter of fact, it is likely that it made possible the survival of everything we know as civilization. Had the Christian fleets sunk off western Greece on October 7 in 1571, we would not be here now, these words would not be written in English, and there would be no universities, human rights, holy matrimony, advanced science, enfranchised women, fair justice, and morality as it was carved on the tablets of Moses and enfleshed in Christ. Many banners wafted at Lepanto. The great one bearing an image of Christ Crucified was the gift of Pope Pius V to Don Juan of Austria. 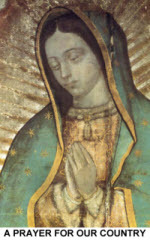 One of the admirals, Gianandrea Doria, a nephew of Andrea Doria often confused with his uncle, used as his ensign, if not a banner, an image of Our Lady of Guadalupe, this only forty years after her appearance in Mexico. The bishop there had commissioned five copies, touching each to the original tilma. The one gifted to the King of Spain, Philip II, was in turn entrusted to Doria for the battle. Then there was the sixteen-foot long silk banner of the Ottoman admiral Ali Pasha decorated with Quranic verses and the image of a zulfiqar, the double-bladed sword said to have been what Mohammed had used in his slaughterings, with the name of Allah stitched in gold 29,800 times. Naval historians have extraordinarily detailed resources for studying the battle. Perhaps the most literate remembrance is that of Cervantes who fought heroically at Lepanto despite a severe fever and wounds; later he was able to write Don Quixote with his right hand, the left being totally useless after October 7. Pope St. Pius V never recorded the details of his astonishing vision on that day, but he saw the scene miraculously while in the church of Santa Sabina discussing administrative accounts with his advisor Bartolo Busotti, and announced the victory to him, nineteen days before a messenger of the Doge of Venice Mocenigo reached Rome with news—no longer new—of the great victory. “Let us set aside business and fall on our knees in thanksgiving to God, for he has given our fleet a great victory.” Five years later the astronomer and geographer Luigi Lilio died. He was a principle architect of the Gregorian calendar implemented in 1582. Trained minds like his, acting upon the testimony of witnesses, calculated by the meridians of Rome and the Curzola isles that the pope had received his revelation precisely as Don Juan leaped from his quarter deck to repulse the Turks boarding his vessel and when the Ottoman galley “Sultana” was attacked side and stern by Marco Antonio Colonna and the Marquis of Santa Cruz. Despite the Muslim defeat at the gates of Vienna in 1529, the Ottoman Empire was at its peak under Suleiman the Magnificent, having conquered Belgrade, Budapest, Rhodes and Temesvar after Aden, Algiers and Baghdad. It stretched from the Caucuses, Balkans and Anatolia to the sultrier climes of the Middle East and North Africa. One stubborn obstacle was Malta. Suleiman, rather like Herod with Salome, was cajoled by his chief wife Hurrem Sultan and the concubines of his harem to take it. Too old to lead the attack, he dispatched his fleet in 1565 with 40,000 troops among whom were 6500 Janissaries, the Navy Seals of their day, many of whom had been captured in youth and obliged to convert. The Turkish sails were spotted by the Knights of Saint John on May 18. The knights had confessed and attended Mass and, against all odds after a siege of four months, only 10,000 Turks survived to limp slowly back to Constantinople. This then was the efficient cause for the frail Dominican pope to summon Christians to battle, putting the Protestant calamity on the back burner to organize a Holy League against the immediate military threat of Islam. The League was announced in the Church of Santa Maria sopra Minerva in Rome, smoothing over differences to unite the Papal States, Spain and Genoa. Venice, its commercial interest paramount, was reluctant to offer the help of its galleys. No aid came from the Protestant queen Elizabeth, and France had already been compromised by trade agreements with the Turks immigrating into Toulon. French manufacturers in Marseilles even sold oars to the Turkish navy. While Chesterton may have been too self-conscious in some conceits of his poem “Lepanto,” he accurately summed up that scene: “The cold queen of England is looking in the glass; The shadow of the Valois is yawning at the Mass…” Venice at last joined the League, urged by the preaching of saintly men like Francis Borgia. The pope rather surprisingly chose Don Juan of Austria, natural son of the late Holy Roman emperor Charles V and half-brother of the Spanish king Philip II. He was everything the aged and arthritic pope, reared as an impoverished shepherd boy, was not and almost nothing of what the pope was save for his love of Our Lady: a beguilingly handsome flirt and elegant dancer and acrobatic swordsman, who kept a lion cub in his bedroom along with a pet marmoset. But he was well acquainted with war from experience with the Barbary corsairs. Embracing him, the pope’s rheumy eyes stared into the flashing face of the prince and said: “Charles V gave you life. I will give you honor and greatness.” Then he entrusted to him the banner of Christ Crucified for his ship. Like Cervantes, he was only twenty-four years old, roughly the same age as some modern youth on our college campuses who demand “safe spaces” to shelter them from lecturers whose contradictions of their views make them cry. The pope knew that the enemy’s goal was Rome itself. Sultan Selim had vowed that he would turn the Tomb of Saint Peter into a mosque. In 997 the Muslim commander of the Ottoman caliph, Almansure, had desecrated the shrine of Santiago de Compostela, turning its bells upside down and filling them with oil as lamps in honor of Allah. Selim promised to do the same in Rome. As Don Juan was approaching the harbor of Messina to take charge of the papal fleet of 206 galleys and 76 lesser vessels, Cyprus was under siege. When its governor Marcantonio Bragdino refused to yield his young page, Antonio Quirni, as a hostage to the lecherous Muslim commander Lala Mustafa, he was humiliated and tortured by inventive methods and flayed alive. His taxidermied body was hung from the main mast of Mustafa’s galley as it sailed off to Lepanto. His fleet having crossed the Adriatic Sea and anchored between Corfu and the west coast of Greece before moving into the Gulf of Petras, Don Juan enjoined upon his soldiers a three day fast, as priests of the orders, Dominican, Theatine, Jesuit, Capuchins and Franciscan heard confessions on deck. Prisoners who had been galley rowers were released and armed, and every fighter was given a Rosary. By the day of battle, the future Feast of Our Lady of the Rosary, perhaps by providence disguised as happenstance, the Christian fleet took the form of a Cross and the Muslim fleet was arrayed as a Crescent. At midday on the flagship Reale, Don Juan unfurled the blue banner the pope had given him and the troops cheered, trying to drown out the intimidating sound of cymbals, gongs, drums and conches from the Muslim fleet. The battle lasted five hours, during which a sudden 180-degree change in the wind favored the Christians who unfurled their sails as the Turks struck theirs. In blood-reddened water, the Reale clashed against the Sultana, and a musket ball killed the Muessunzade Ali Pasha, while Don Juan survived a leg wound. The engagement of flagships was uncommon in naval protocol, but such was the intensity of the battle. More unusual was the presence on the Reale of Maria la Bailadora (“The Dancer”), the lover of a Spanish soldier, who disguised herself as a man in armor. She promised to avenge all women violated by the Turks. A trained arquebusier, she also engaged some Turks in hand to hand combat and dispatched one with several thrusts of her two-edged sword. While the fleets were matched pretty evenly, the Christians made unprecedented use of gunpowder and heavy artillery against the Turkish arrows. Almost all of the Turkish vessels were lost or captured, more than 30,000 Turks died, and fifteen thousand Christian slaves were freed. 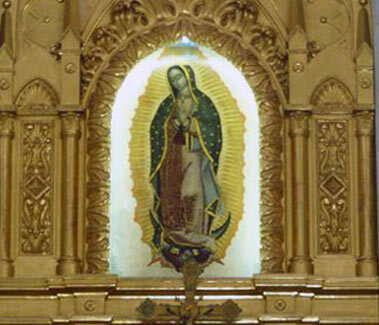 The image of Guadalupe from Admiral Doria’s ship is now enshrined in the Church of San Stefano in Aveto, Italy. Don Juan’s papal banner is in the Escorial. Admiral Marco Antonio Colonna’s threadbare standard is in Gaeta’s Pinacoteca Communale. One of Ali Pasha’s banners is in the Church of Santo Stefano in Pisa. Another is in the Palazzo Ducale of Venice. Pasha’s flagship banner decorated with Quranic verses from the 48th surah Al-Fath (The Victory) hung near the tomb of St. Pius V in Santa Maria Maggiore. In 1965 Pope Paul VI attempted a gesture of goodwill by returning it to the Turks. Indulging some antiphrasis, it is not necessary to comment that Paul VI was not a military man. The gesture was perplexing to those who harbor a memory of sacrificial valor, and it must have been an awkward reminder to descendants of the defeated. The banner now hangs in the Naval Museum of Istanbul. Sloganeers avow that some wrong roads are paved with good intentions. The altruistic return of the banner of Lepanto has not enhanced “peace for our time.” In 2011, construction of the 300-foot corvette Heybeliada was completed: the first modern warship built in a Turkish shipyard. The prime minister, Recep Erdogen, attended the dedication ceremony and pointedly remarked that it was the 473rd anniversary of the Battle of Preveza, when an Ottoman fleet led by Hayreddin Barbarossa defeated a Holy League organized by Pope Paul III. Erdogen made no allusion to the subsequent defeat of the Turks at Lepanto. In 2014 he became Turkey’s first directly elected president. One can only speculate about what he would eventually want to do with Ali Pasha’s banner.